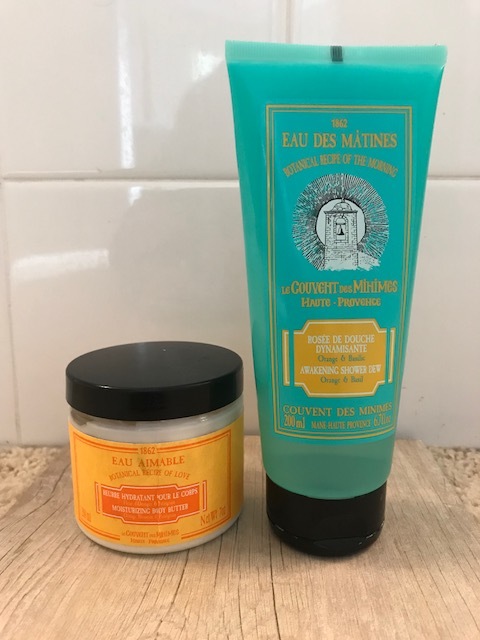 Break out the summery scents in your bath and body products with LE COUVENT des MINIMES. Ranging from lotions to shower dews, these products smell absolutely wonderful! These skin products are also each thoughtfully blended to give you the finest natural care. Made from soothing botanicals and restorative plants, your body will get the love it deserves while bringing out fragrances that evoke the charming French countryside. These products smell amazing and leave a soft scent on your skin. Eau Aimable Body Butter ($18). with nourishing Shea butter and a rich formula, this body butter from LE COUVENT des MINIMES will help protect and moisturize your skin, leaving it nice and very soft. You’ll enjoy infusions of Bergamot and Mandarin which gives a scent of serenity, while Nasturtium reveals your skin’s natural radiance. I’m in love with this body butter. It’s not at all greasy and makes your skin soft to the touch. Okay, my most favorite of all time is a body cream called Eau Aimable. It’s absolutely glorious and the scent is fantastic with Orange Blossom, Pettigrain and Shea Butter. What a luxurious combination. It gently cleans away oil and impurities. I can’t get enough of this cream. I also love their shower gel, Eau des Matines, Botanical Recipe of the Morning ($12). This awakening shower dew is filled with the fragrance of orange and basil, cedar and lemon. A small amount of dew lathers up big with a loofah or pouf. I took a shower tonight and let me tell you my skin is so soft right now it makes me happy! If you order one thing, let it be the body cream. It’s fabulous! LA COUVENT DES MINIMES is located in the village of Mane, on the alps of France. Built in the 17th century, to became a hospice in 1862. Today the company’s beauty recipes pay homage to the long tradition of care and well-being through plants and of generosity. 1% of this company’s sales are repaid to the association of the Franciscan Missionary Sisters of Mary in order to support aid projects for children, education and health in India. Great company values and fantastic beauty products.